At Zetland Boxes we offer a bespoke box service. All we need to know from you are a few quick questions and we can have a quote done and emailed back to you as quickly as possible. We can do more than just normal boxes. We offer die cutting services for retail ready boxes. Just leave any special requests in the box below. When giving us your sizes please use this as a quick guide. 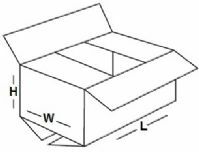 Box Size (mm or inch): Length - Width - Height - Thickness - Single 3mm or Double Wall 4mm Quantity required - Any more info? Just leave us a message.